I had never understood why the farmlands of the US had been settled in such a sparse and isolated way, whereas the farming communities in Europe seemed closer, more convivial, centered around village life. It turns out it was mostly due to the Homestead Act, passed by Abraham Lincoln in 1863, which granted land to homesteaders, 160 acres each, from unappropriated federal land. The medical observers of the early century had a good deal to say about the life of women in soddies, on lonely homesteads, and what it could do to them. Americans made a mistake they have been paying for ever since. In response to the Homestead Act they have been strung out at nighttime into a vast solitude rather than linked to the old-world village with its adjoining plots. 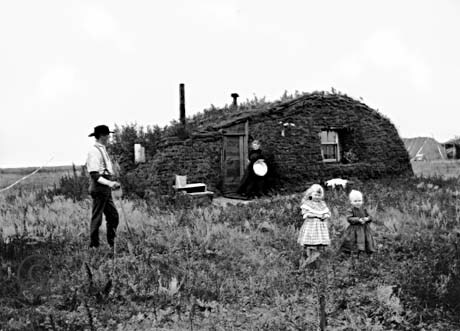 A Milton, North Dakota, photographer took this picture of John and Marget Bakken and their two children, Tilda and Eddie, in front of their sod house in Milton in 1898. John Bakken was the son of Norwegian immigrants, who homesteaded and built a sod house in Milton in 1896. This sod house was used as the basis for the design of the Homestead Act Commemorative Stamp in 1962. Some thoughts for you: A lot of towns were built on railroad right-of-ways and the land granted in a checkerboard pattern along those. Rainfall greatly affects the ability to make a living farming and as you move west into the Dakotas, Nebraska, Kansas, Oklahoma and Texas, you need an increasingly large amount of ground to do more than subsist. Density in the rural Midwestern and the Western U.S. probably peaked 1920s before families started getting smaller and farms started getting bigger and people began migrating in increasing numbers to urban areas. One of the reasons Europe has so many more people in a smaller space is those communities grew up over hundreds of years (much longer than the 160+ for large swathes of the plains and West.. Many Europeans from agrarian families migrated to the U.S. because there was no more land in their family for them to farm. It had gone to an older brother or just could no longer be subdivided and provided a living.